HOUSTON (ICIS)--In the US, wax market participants are cautious about forward supply since the US is a net-importer of paraffin waxes, mostly from China. Complicating factors arose as the United States Trade Representative (USTR) moves to impose tariffs on $200bn of Chinese imports, with paraffin wax marked as one of the products involved. US sources said a 10% tariff is aimed at the $200bn of Chinese imports. This is supplemental to an earlier proposal after a $50bn product tariff level was met by retaliatory actions from China. The USTR is seeking public comment and will hold a public hearing regarding this proposed action, with a post-hearing comment period out to 30 August. US paraffin wax supply is narrowly balanced to demand in July. Several producers sought to raise prices in June at low-based accounts. Not all producers moved for higher prices, keeping the 1-2 cents/lb increases sought by others from being a market-wide price move. Fully refined paraffin wax (FRP) prices in the 125-140F (52-60C) meltpoint range were most recently assessed by ICIS at 63.96-73.48 cents/lb ($1,420-1,640/tonne). Since there are ongoing paraffin wax trades from China to US, comments from Asia offer key insights to prospective regional impacts from tariffs to regular trade patterns and pricing. Asian sources said Chinese traders are at this time basically trying to reduce inventories now because of the uncertainties and likelihood for a price fall. “The 10% tariff on Chinese paraffin wax into the US, once finalised, is likely to put downward pressure on Chinese paraffin wax prices,” a Chinese trader said in Mandarin. US prefers importing liquid paraffin wax than solid paraffin wax, and there is no import duty into the US for Chinese paraffin wax currently. “Either Chinese producers will have to reduce the prices of liquid paraffin wax to sustain trade volume to the US, or they convert production to make more solid paraffin wax and sell it elsewhere, which will cause a drop in solid paraffin wax instead due to excess supply,” the Chinese trader elaborated. US buyers will likely need to continue buying from China regardless of the tariffs, “since the bulk of US demand relying on Chinese product will probably remain”, a separate Chinese trader said in Mandarin. “Only when the tariffs are imposed, will we know how the market will 'absorb' the tariffs, be it by buyers, producers or both,” a third Chinese trader said in Mandarin. In Europe the recently announced 10% tariff on Chinese paraffin wax imports into the US has yet to impact the European paraffin wax market, with players currently in wait-and-see mode. In the past few years, US paraffin wax prices have been higher than those from China, so some European players are unsure as to whether the new scenario will have any significant impact on trade flows. One European source suggested that players from China may lower prices to ensure access to the US market amid the tariff change, with the country having ample product to supply both the US and Europe. There has been no evidence of increased export flows from China to Europe since the tariff change was announced, but this could be something for the European market to watch out for in future, should the situation persist. 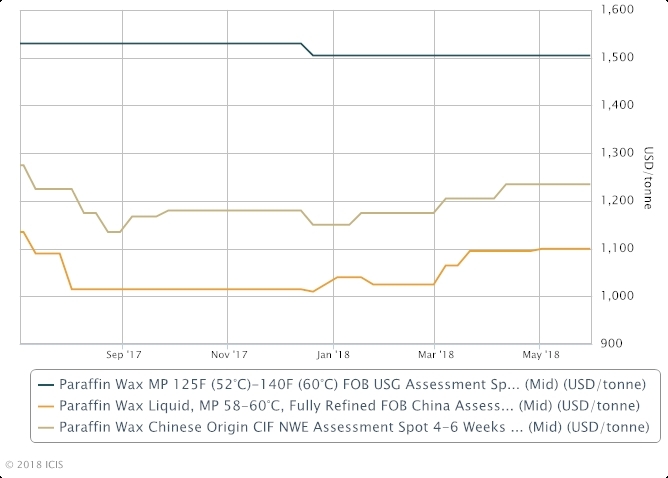 The following graph shows European wax price trends for Chinese origin material on CIF (cost insurance freight) Northwest Europe basis, the Asian price trends on liquid fully refined wax at 58-60C FOB (free on board) China and the US 125-140F meltpoint price trend. All are shown in US $/tonne. Click here to view related stories and content on the US-China trade war landing page.